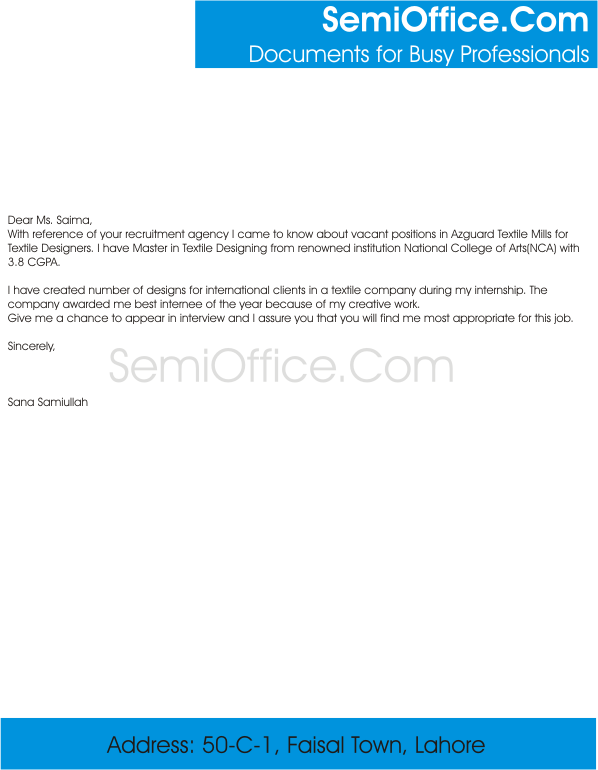 Sample letter of recommendation for interior designer job in company, international company, abroad or student as decrator etc. Dear Mrs. Clover I’m writing to you because you told me last week that you are looking for an interior designer. I can recommend someone for you. She is the same person who did my whole house when I had it redecorated. She is very good at her work and she had a decent fee. I hope you like what she has to offer I will give you her contact details. Mobile number——————– Email- —————————————. I am fine and I hope you are fine too. It’s been long since we wrote to one other and I was dancing in joy when I received your letter last week. I am more than happy to know that you are doing great with both your health and your career. Can’t wait to be there for your marriage! You mentioned in your letter that you have bought your own house and I Congratulate you for that from the bottom of my heart. Furthermore, you also asked me if I know any interior designers that would make your home look like a dream palace and decorate the rooms accordingly and I have to say that Yes! I know someone. Remember Jamie? She went on to pursue her career in interior designer and I must say she really made a career out of it. Her portfolio is full of projects that she designed for and all of them are more mesmerizing than the other. I think you should hire her as your interior designer. As she was our friend, she might even consider giving you a concession for her services and I assure you that you will be more than happy by her work. Sample application letter for design approval to boss, vendor, designer etc and reverse letter to the client for design approval. It is submitted that we are going to construct our house on our 5-marla vacant plot situated at satellite town. For this purpose, we have gotten a suitable design from an architect which is attached herewith. You are requested to please give approval for the design of our house at above mentioned place. Thank you for your time and interest in our case. My family and I shall be grateful to you. It is to inform you that your design which you have made on a fabric through the fabric painting technique has been accepted by our manager of Rose Petal & Co. We are glad to announce you as the new designer for our upcoming clothing brand. We hope to have a good working experience with you. I hope you are doing well and the work you have started is also progressing. I have received your letter which includes all the instructions related to the design which you wanted me to make. The design for the product you required is in the final stage and need your approval to be finished. I specifically follow all the instructions given by you in person and written in the instruction letter by you. I slightly changed few things which were important as I found. I hope you would like the design and a little change added by me. I am waiting for your reply and if there are any suggestions it would be most welcome. The design will delivered to you in final form right after your approval. Sample job application to apply for the post of graphic designer in designing company, web development company, marketing agency etc. I am Graphics Designer, and i want to apply job from another company, how can i write? I just went through your ad while surfing though the net and came to know that you are looking for a graphic designer. I have done short courses of Graphic Designing and have a thorough knowledge of Photoshop and other related software. I have worked as graphic designer in NUCES, ACM. It is my humble request that you please grant me the job of Graphic Designer at your office. I have come to know about your hiring of Graphic designer through newspaper. I would like to apply for the position. I have graduated in arts and design and I am a diploma holder in graphic designing. I have done several internships and currently working for a big clothing brand. Now as I am moving to New York that is why I have to leave my job. I am writing this to avail a great opportunity of applying in your company as Graphic Designer. It came to my knowledge through advertisement in today’s newspaper that your company is looking for fresh recruits with little experience. As a keen and passionate candidate I believe I fulfill all the required qualifications. Having graduated with degree in Graphic Designing from a famous institution, I started working in another advertisement company as graphic designer. I had worked there for more than one year. However, due to unforeseen circumstances, I had to travel to another city. Now I am looking for a job again and your company is offering exactly the professional environment I am looking for. I assure you that my skills shall become a valuable addition to your company and I will give a boost to its performance. I am writing to you because I would like to join your organization. I am a graphics and communication student. I am looking for some good work experience for my course and this is the perfect exactly what I am looking for. I am a very good worker. I know that I don’t have the relevant experience but I do have the knowledge and I just need for someone to give me a chance to start and get the experience that I need. I hope that you would consider me into joining your organization. Many thanks and I look forward to hearing back from you.